Digitized Service Record: note that this soldier is not listed on the LAC using his regimental number. Use only his name to search for him. Source: “Duty Nobly Done” page 279. Wounded by shell bursting in billet 09/07/17. Note that his father, Private John Faulkner, reg. no. 53106, enlisted and served at the beginning of the Battalion’s duty on the Continent but was medically discharged. Awarded the Croix de Guerre by His Majesty The King of Belgians, for distinguished services rendered during the course of the campaign. 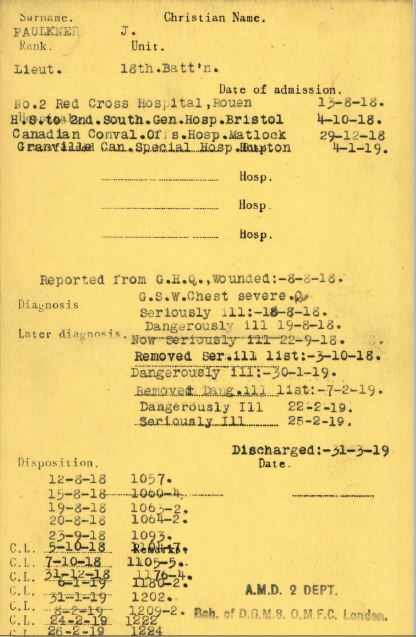 Record showing the scope of treatment and status of this soldier. Lt. Faulkner suffered a serious wound to his left chest.